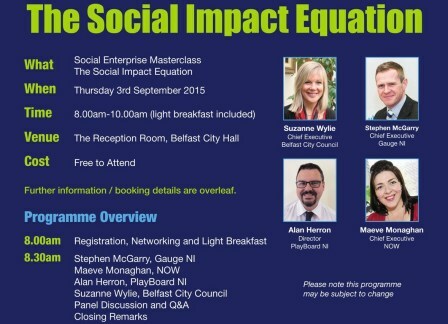 The ‘Social Enterprise Means Business With Purpose’ Masterclass Series will kick off on Thursday 3rd September with a session exploring The Social Impact Equation. Suzanne Wylie, Chief Executive of Belfast City Council, is one of the speakers at this breakfast event. Click here for more information and to book your free place.